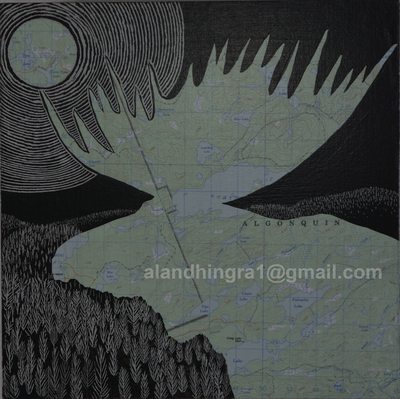 Alan graduated from the Ontario College of Art (now known as OCAD) in 1984. He has been painting, drawing, experimenting and printmaking for over 30 years. Alan, his parents and sister immigrated to Canada in 1966 . His love of nature, hiking and exploring was nurtured by the 65th Toronto High Park Boy Scout Troop in which he enrolled upon arrival in Toronto. Since that time he has paddled and hiked many kilometres while camping with friends and family. Alan's love of the natural world, his enjoyment of canoeing and camping and his affinity for the topographic maps used during his trips to the wilderness have inspired a new series. " In Wilderness Series my work evokes memories and feelings, connections to the landscape and what can be discovered in it. The images, textures and colours remind us all of the bond we have with the natural world and the memories we create with friends and family as we chance upon the inhabitants of these still wild places. I hope everyone can discover and spend restorative time in these areas that have become too far removed from our everyday lives." 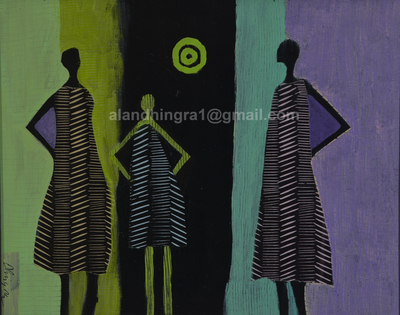 Alan combines pattern, texture and colour while exploring the relationship between positive and negative space. "My paintings are composed of multiple layers of paint applied to topographic maps I have affixed to birch panels. 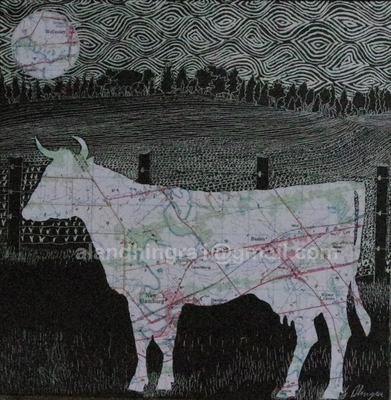 The years I have spent printmaking have influenced my paintings, I often incorporate sgraffito and other mark making techniques in my work." Alan lives in and maintains a studio, STUDIO 234, in St. Marys, Ontario. He is honoured to have his work hanging in private collections around the world. His work has also been featured in many juried shows and local galleries. Alan's work can also be enjoyed and purchased in Ontario cities Stratford at Village Studios, Bayfield at Marten Art, Wildewood Gallery, Maynooth and The Potter's Studio, Huntsville. 234 Queen St. E. St Marys, On.